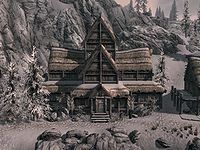 The White Hall is a large two-story structure that sits on a hillside overlooking most of Dawnstar. It is found next door to Dawnstar Barracks. The hall is home to the Jarl of the Pale as well as their court and servant. It contains only one area: The White Hall. Build Your Own HomeHF: Construct a house for yourself. There are several snowberry bushes on either side of the front of the building. There is a short flight of steps leading up to the main door. When you first arrive in Dawnstar you can witness an interesting exchange between Skald and Brina Merilis with Horik Halfhand in attendance on the steps in front of the building. Upon entering you are at the end of the main room where the Jarl holds court. 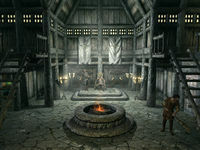 The Jarl sits on their throne during the day with their housecarl beside them. On either side of the room there are small round wooden tables holding bottles of wine and alto wine. There are two round firepits down the center of the room with the throne at the end on a slightly raised platform. There are two flights of stairs—one against the west wall and the other against the east, both of which lead to balconies and small bedrooms on the top floor. Under the stairs there is a doorway to the east and a door to the west. The west opens into the Jarl's bedroom and the east leads to the room used by the military advisor and where the court wizard Madena sells her wares. There are Dawnstar banners hanging from the walls above the throne. The doorway to the east leads to a room with six weapon racks holding a selection of iron weapons along the west wall with two barrels in front. There are two potions of plentiful stamina and three potions of minor healing on top of the barrels. On the ground by the northern barrel is a copy of the Enchanting skill book Catalogue of Weapon Enchantments. Against the north wall are a couple of straw bales with a practice dummy in front of them. To the right of the bales is a long wooden table with three bottles of Nord mead and a map of Skyrim marking the progress, if any, of the civil war. The military advisor will spend most of their time studying this. In the corner to the right are a couple of food barrels. Along the east wall there is a large pile of firewood beside an unlocked chest. Above the chest, on top of a wall shelf, are several potions that can be bought from Madena (see notes). There are more food barrels in the southeastern corner. 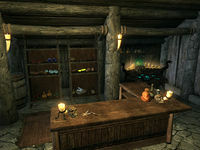 On your right as soon as you enter the room, against the south wall, is an arcane enchanter, with a wall shelf above it holding more potions sold by Madena. To the left of the enchanter is an L-shaped counter, with a bottle of alto wine, a large coin purse and some ingredients sold by Madena on top of it (see notes). Under the counter is a small coin purse. Against the south wall behind the counter are two sets of shelves full of items sold by Madena (see notes). The Jarl's bedroom consists of a king-sized bed in the middle of the room on a raised platform with four tall and one small wardrobe all containing fine clothes along the west wall. There are several food barrels and sacks around the room. Against the south wall is a large round wooden table and two chairs. On the table is a bottle of alto wine and a bottle of wine. Against the north wall is a long unlocked chest containing minor loot and to the right of this is a second round table and two chairs. On this table is a bottle of alto wine, two bottles of wine, a large coin purse and seven loose coins. There is also a long wooden bench along the east wall. The balcony to the east has a small round wooden table holding three bottles of Nord mead and a chair beside it. Several barrels and a larger round wooden table and chair. On this table is a bottle of Nord mead, a bottle of alto wine and a copy of the Destruction skill book The Art of War Magic. There is also a door to a bedroom, which continues further east. The bedroom has an owned single bed against the east wall, in the northeastern corner, with a small wardrobe to the left of it. On the wardrobe there is a giant's toe, a bowl of glow dust and a bowl of frost salts. Further along the east wall is a long unlocked chest containing minor loot. In the southeastern corner is a food barrel with a large coin purse and five loose coins on top. Next to it, against the south wall, is a set of shelves holding a goat cheese wheel, a goat cheese wedge, a copy of The Talos Mistake, a copy of Treatise on Ayleidic Cities, three lockpicks, a medium coin purse, a bottle of Nord mead, two bottles of alto wine and four bottles of wine. Next to the shelves is a chair. The balcony to the west has two bales of straw stacked in the northwestern corner and a round wooden table in front of them with two chairs. On the table are two bottles of Nord mead and a bottle of alto wine. There are several barrels on the balcony, one of which has a bottle of alto wine on top. The bedroom has an owned single bed against the west wall in the northwestern corner. Opposite it, against the east wall, is a long unlocked chest. In the middle of the south wall is a set of shelves holding three green and two red apples, two flutes, three lockicks, an eidar cheese wheel and a goat cheese wheel and a lute leaning against the front of it. On either side are food sacks, with a chair to the right and two drums next to the chair. To the left of the door as you enter there is a wall shelves holding a potion of minor healing, a potion of minor magicka, two red and three green apples. The following items are sitting out in the room on the counter or shelves. They can be purchased if you have the relevant skill perk (see notes) or taken for free if your disposition towards Madena is high enough. They respawn after ten days. Ingredients: 5 bone meal, 1 canis root, 5 chaurus eggs, 1 creep clusters, 2 deathbell, 1 ectoplasm, 1 falmer ear, 1 frost salts, 2 giant's toes, glow dust, 5 hagraven claws, 1 hagraven feathers, 4 ice wraith teeth, 1 orange dartwing and 3 torchbug thoraxes. Poisons: 1 lingering stamina poison, 1 poison, 1 weak poison. Potions: 1 draught of enhanced stamina, 1 draught of illusion, 4 potions of enhanced stamina, 1 potion of illusion, 1 potion of lasting potency, 2 potion of lockpicking, 4 potions of minor healing, 2 potions of minor magicka, 1 potion of strength.